The new Google AdWords “Communication Ad Extensions” have started to appear in search results for limited queries and searchers. These new extensions provide additional options for searchers to contact the advertiser that go beyond the click. 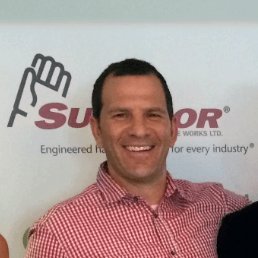 Surfers now have the option to Request Call or Request Email. Communication Extensions are intended to be a simple lead generation solution that helps connect potential clients and customers (searchers) with businesses (advertisers) right from the search engine result pages. Google AdWords "Communication Ad Extensions"
The Request Call option might be the the most exciting of the Communication Extension features, especially for sales managers who covet “hot” phone call leads over web forms and emails. Once the visitor fills out the Request Call form with their phone number and any additional details, Google will then send the advertiser/business contact person an email with a special Google forwarding phone number. They will then be able to call the forwarding number and be directly connected to the potential customer without seeing the users phone number. This is a security/privacy step that Google takes to help protect user’s information until the user is ready to hand that over the the business. In a similar manner to the Request Call option, once the visitor fills out the Request Email form with their email address and any additional details, Google will send then the advertiser/business contact person an email with a special Google forwarding email address. Advertisers will then be able to reply to the forwarding email address, which Google instantly forwards on to the user. This will keep the user’s email address confidential until the potential customer chooses to share it. Both Request Call and Request Email each have the additional linked option for “Provide more details” that will enable a text area that the searcher can provide additional details or questions. Common items that will often be placed here would be contact name, contact phone number for Email requests, contact email address for Call requests, individual info requests such as requests for quote, questions, or whether the advertiser services their area, industry and specific needs. This additional information is great for a sales staff to have a starting point for assessing the lead and how to proceed next. After filling out the form, Google sends you the following template email that lets you know that your information has been sent to the AdWords advertiser. message as replies to this email address are not read. Needing to be signed-in to Google Account? However it is not a requirement to use the email address that is associated with your account that you are currently logged in to, as I changed the one associated with my account that auto populated in the email box, to another one, when I tested one of these ads. Leading to an Increase in Ad Performance & CTR? I have seen an increase in CTR’s and ad performance after launching ad extensions for various AdWords PPC campaigns that I have managed. It has also been written time, and time, and time again that AdWords Ad Extensions can boost Click Through Rates for your Text Ads simply by drawing more attention to them. It is probably safe to say that having these active on your campaigns will produce in similar results. Especially if you have both Call and Email extensions activated as searchers will have more options for which to choose from. A New Pay-Per-Lead / CPA Solution akin to Conversion Optimizer? We are likely witnessing the beginning of an alternate form of revenue for Google. Communication extensions have the potential to eventually become an independent cost-per-action product to replace the current PPC advertising format. This would likely only be for select verticals and search terms that Google is able to determine that they can make more revenue per search by selling “leads” instead of clicks. The current Conversion Optimizer is a tool that only needs to be slightly re-imagined and re-developed for in-search tracking to serve this purpose. You’re going to have to be very careful enabling, and writing ads for Communication ad extensions when bidding on branded keywords. The process for which the user submits their information to the advertiser, whether for a call or email, creates dummy email addresses and phone numbers. This is the privacy procedure for Communication extensions in which “Google Protects Your Information” (below). If the searcher is already familiar enough with the business to search for them using a branded keyword, there is a good chance that they would prefer the direct and official contact info. Instead of using the Request Call ad extension for branded campaigns, you’re probably better off listing the official phone number in the text ad and save yourself some clicks for the searchers who are looking only for a phone number. And instead of using the Request Email ad extension, you are better off sending the visitor to the site directly where there will be the opportunity to get them to fill out a contact form that will ask for more information, like phone number, contact name, and a real email address (see below). Also, once on the site, the visitor will now have access to business hours, specials and sales, entire product and service line, and anything else that you want them to see and interact with that may lead to a stronger experience with the brand. Tapping into a competing brand’s search volume is a common practice for most ppc marketers. And since these new communication extensions are primarily for lead generation, you can reasonably expect to be able to utilize these for campaigns targeting competitor branded terms that have the goal of generating leads. Since Communication Extensions are primarily a lead generation solution, you will find fewer uses for ecommerce pay per click campaigns. Instead, you are better off using Product extensions, Sitelink extensions, or even the alternative Product Listing Ads. If, like me, you are obsessive with attribution and tracking visitors and conversions within your web analytics platform, then these new extensions are probably going to cause you to reassess your reporting. Since the “Lead” did not first land on your site, First Click and Multi-Click Attribution might not be possible and we may be left with attributing the visit to the Last Click that occurred. Which will probably be during the follow-up correspondence with the lead. This will often result in a click from A) a browser address bar type in direct visit, B) a branded term search engine visit (probably via Google seach), or C) a link within an email that will then be attributed as a direct visit or referral from Yahoo Mail (mail.yahoo.com), Hotmail (mail.live.com), Gmail (mail.google.com), Comcast (mail.comcast.net) or some other web-based email service. None of which will correctly tag the original point of reference back to the paid ad and keyword that was generated by AdWords. For the Google Content/Display Network? For the near future, I can’t see this feature being active for use on the Display Network. Currently there are no Ad Extensions active on Google’s Display Network, and this will probably not change for Communication extensions. Location extensions: Your ad may also be shown without the location extension across the Google Search and Display Networks if you have also enabled your campaign to appear on these networks. Product extensions: Product extensions will not appear on other Search Network sites, or on Display Network sites. Also, less than ethical AdSense partners have been known to fake leads by submitting dummy information, just so their fraudulent clicks appear to convert and be of higher quality. The same type of abuse could apply here. It’s one thing for advertisers to accept some small measure of click fraud, it’s another thing entirely when those same advertisers also have to waste their time following up on validating them. *Update on 6/16* – Search Engine Land has confirmed with Google that AdWords has been testing these on the Display Network. Other than acknowledging that the display ad test was happening, and tacitly confirming that it was appearing on Google Display Network sites, Google wouldn’t provide further information on the display ad test. Google has put in place a Help Article that is located in their Web Search Help section covering how they handle your personal information. It is referenced via links next to the ads in the search results (below) and again in the default template email (above). The following is Google’s policy on Protecting your privacy with Communication Ads. Phone calls: When you submit your phone number in order to receive a call from the advertiser, the advertiser will instead receive a special Google forwarding phone number. Advertisers will call the phone number provided by Google, and Google will instantly forward advertiser’s calls to you, so your phone number remains confidential. The advertiser won’t receive your actual phone number unless you choose to share your number with the advertiser during the call. Emails: When you submit your email address in order to receive an email from the advertiser, the advertiser will instead receive a special Google forwarding email address. Advertisers will email the email address provided by Google, and Google instantly forwards the email to you, so your email address remains confidential. The advertiser won’t receive your actual email address unless you choose to share your email address with them directly. 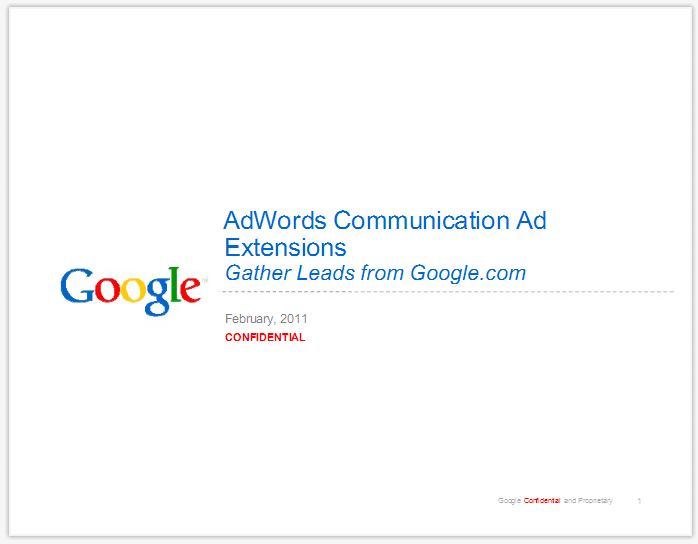 Google documents from February 2011, marked Confidential and Proprietary, and titled “Google AdWords Communication Ad Extensions, Gather Leads from Google.com”, have been posted to scribd.com that show early versions of the Communication Extensions that have since been changed slightly for today’s live version. Based on the fact that these new features process billable “Leads” without the searcher leaving the search result page, I’d say that they are going to be a big win for Google. The person will be able to directly move on to the next ad without having to go back to the original SERP. This will lead to an increase in the average ad clicks, calls and emails per search… = + $ 4 G! While capturing leads and conversions is the at the core of most pay per click ad campaigns, the quality of a “Qualified Lead” is also of high importance. So if the same person is filling out Requests for you and your competitors at the same time, there will be an increased level of competition akin to purchasing non-exclusive leads via a 3rd party lead source. These leads will most likely convert at a lower rate due to the fact the they are less educated about the business in question, having not gone through the standard landing page experience as normal clicks. …and only time will tell. PPC advertisers would be best suited to track these leads, their close rate, and ROI separately from normal clicks. And while you may be able to purchase these leads at the same rate as a click (currently undetermined), saving you from buying 9 other clicks to hit your 10% conversion rate (example only), the end results may not be as good for you as clicks from normal searchers. Only time and tracking will tell. 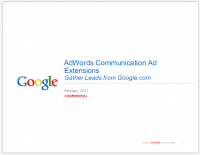 What do you think of Google AdWords new Communication Ad Extensions? Feel free to leave a comment. Great post James, I didn’t even know about this until now… so you’re clearly on the forefront. This is huge for some of our clients. This is a huge change, thanks for the clear write-up and screen shots. Organic listings take on a primitive function and cannot offer/compete with the ad extensions immediate value. Agree, get a quote from all, obfuscate the leads, and get the user to click through the companies ads they are about to get pitched from. Great post James! This is a pretty exciting opportunity that I was not at well versed on, but your detailed breakdown has me ready to jump right in. Thanks for sharing. Good post. Waiting for this to be officially rolled out by Google, as it would help digital marketing advertsers like me to optimise conversions, create specific campaigns for lead generation etc. Haven’t seen any updates yet. At least not yet in Australia.